Is this the secret villa of Russia president Vladimir Putin? Putin critic Alexei Navalny has released drone footage of what he claims is an extensive estate used by the Russian president. The video, viewed more than two million times, is the latest in a series of probes by opposition leader Navalny into the wealth of powerful Russians, which have also targeted prime minister Dmitry Medvedev and Kremlin spokesman Dmitry Peskov. It shows aerial shots of a near 50-acre tree-filled peninsula near Vybord, close to Russia’s border with Finland. 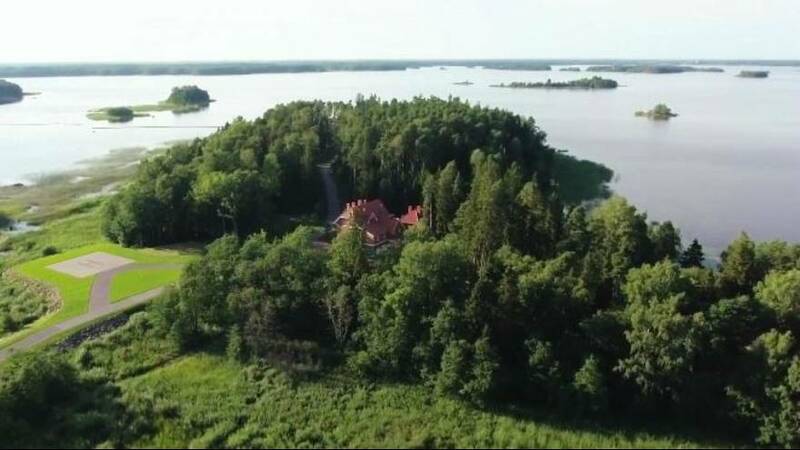 The footage reveals several residences dotted over the island, including Sellgren Villa, which benefits from what Navalny calls ‘unbelievably beautiful views’ over Vybord Bay. The lavish Sellgren Villa, dubbed Putin’s secret dacha, was used as a filming location in a Soviet-era Sherlock Holmes film, according to Russian television channel Dozhd. Navalny probes into the wealth of senior Russian officials are being seen as a springboard for him to challenge Putin for the Russian presidency in 2018. It is unclear, however, whether he will be allowed to stand. Russia’s Central Electoral Commission banned him from taking part in the poll because he was found guilty of embezzlement and given a suspended sentence. Navalny has said the case against him was politically motivated and has vowed to fight on.